Curious about Polarr QR codes? Then this is the page for you! Learn about what they are and how to create or find your own! What is a Polarr QR code? Any series of edits or adjustments made in Polarr Photo Editor can be saved as a custom filter (or preset as they might be called in other apps). Your saved custom filters can then be used anytime you want for future photos. Custom filters can also sync between all of your devices if you have a subscription to Polarr Pro. And the final trick with custom filters from Polarr? These filters can then be shared with others users as a Polarr QR code. As a content creator, Polarr QR codes allow you to share your own custom and unique filters with other users. As a content consumer, Polarr QR codes allow you to use and enjoy filters created by others. Once you’ve made at least one edit or adjustment to a photo you can create your own Polarr QR code. Here’s how you can do that. On step 4 above, you can select or deselect the following adjustments to be saved with your filter: main adjustments, selective adjustments, text, crop, and overlays. Where can you share them and find them? Filters can be shared and found on any social network. That said, we’ve seen some big filter communities pop up in places like Instagram. Head to your favorite social network and do a search for hashtags like #polarrfilter or #polarrfilters. Don’t forget to share your own with the same or similar hashtags. What are Polarr's future plans for QR filters? 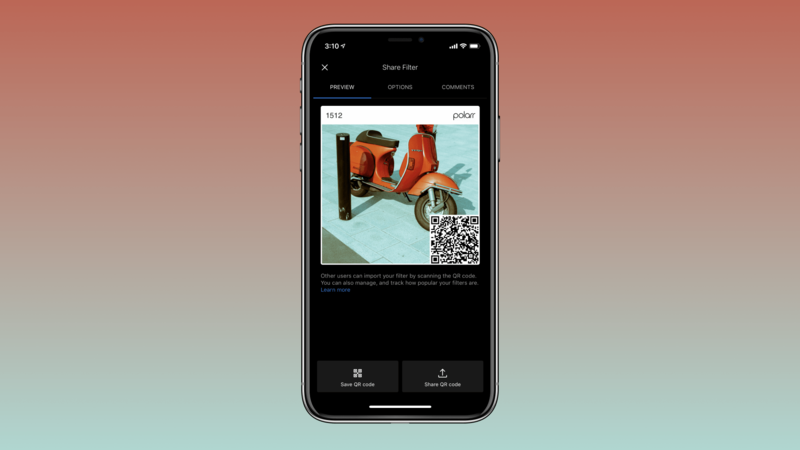 Big things are coming to Polarr QR codes. And we can’t wait to share more with you in the coming months. For now, we’ll tease you with the idea of using your custom filters created for photos on Polarr Photo Editor on videos. Or maybe a way to view all of your filters online. Question: How can I sync my filters? Answer: With a subscription to Polarr Pro! Question: What happens if I lose my filters during an upgrade or uninstall the app? Answer: Unfortunately we can’t recover filters lost in that manner. Which is why having a subscription to Polarr Pro.